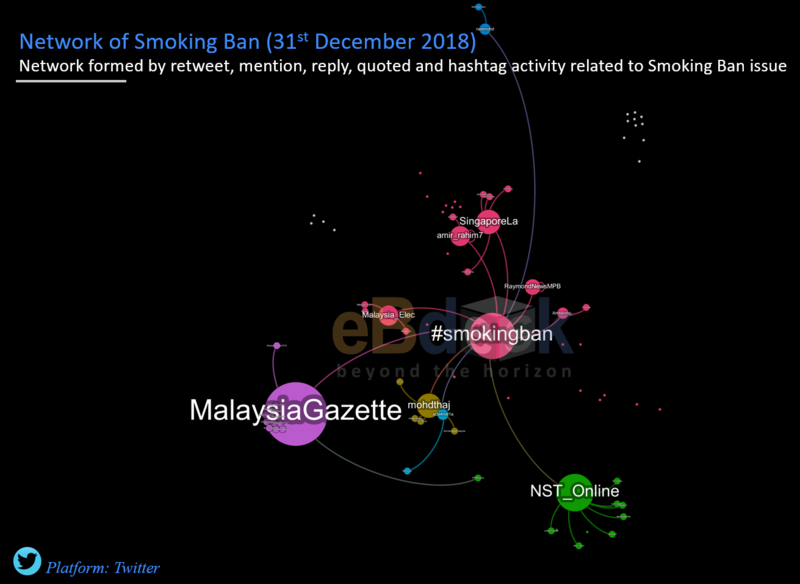 The smoking ban at eateries was officially implemented in Malaysia at the stroke of midnight on January 1. 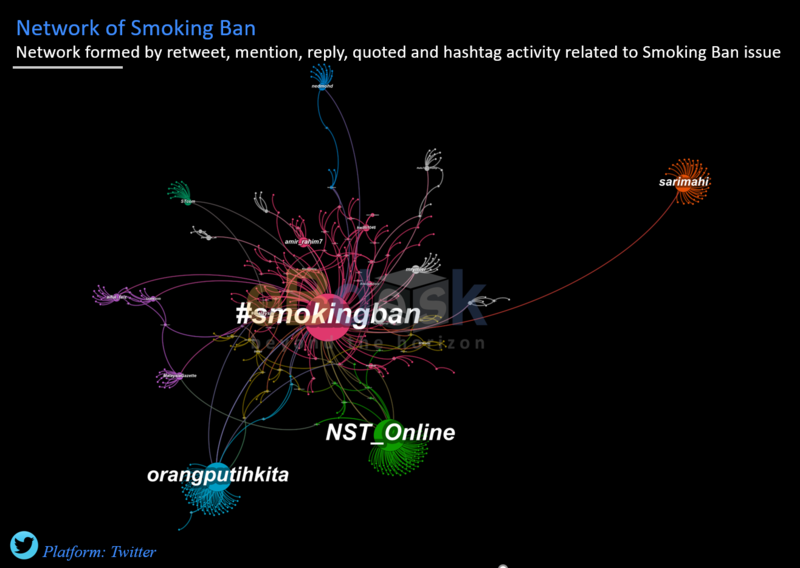 In Twitter, the netizens discussed on the ban prior to the implementation, but the amount is generally low. Based on their tweets, people are divided on the ban, yet majority of them are supporting the new policy. Smokers Right Club filed a judicial review to the High Court regarding the smoking ban. 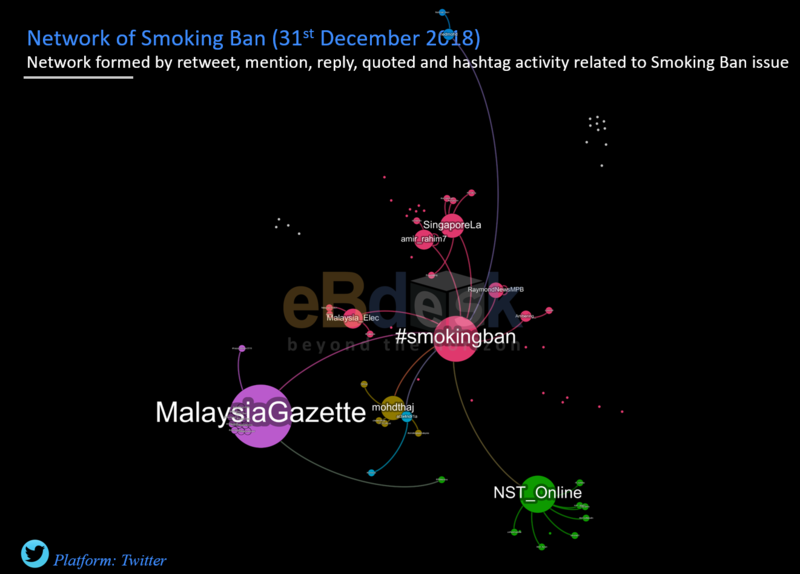 The network shows the topic of smoking ban from December 31 to January 3. We can see that the network expanded, but still it does not have much influencers to direct the issue. @orangputihkita is an influencer based in Sabah who is incline towards the ban. At that time, Sabah government has yet to implement the policy. Sabah Deputy Chief Minister Datuk Christina Liew previously announced that the ban has yet to be implemented as it might scare the tourist away. Nevertheless, on January 9, the Sabah state government has decided to impose the smoking ban starting from February 1. @sarimahi is the official account for local TV host Sarimah Ibrahim who is in support of the smoking ban. Whereas, NST_Online was the most active media in reporting the issue. In the center of the network, the people are divided on the smoking ban. Overall, the we can see that not much public figures or even politicians are active in showing their stance on the ban. Previous PTPTN new loan repayment scheme, a rash move?